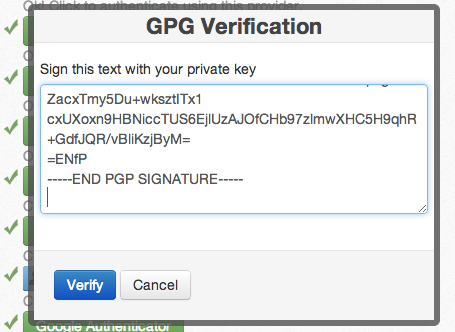 You can sign in on indieauth.com without relying on any external providers by signing a challenge with your PGP key. 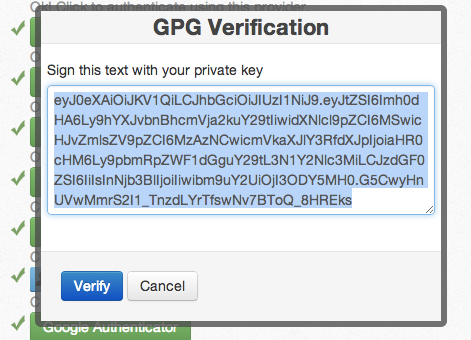 On your home page, link to one or more PGP keys and add the rel="pgpkey" attribute to the links. Make sure to click "re-scan" if you've previously signed in before and have just added your key. When you sign in, you'll see a PGP option listed! Clicking it will present a challenge that you will need to sign with your private key. Sign the text and replace it with the signed version. If you have GPG Tools for OS X installed, you can use the "Services" menu to quickly sign the text. If you use gpg from the command line you can sign a text message with the following command. Paste the signed text in the form field and click "Verify". After the server verifies the signature matches that of your public key you chose, you will be signed in!